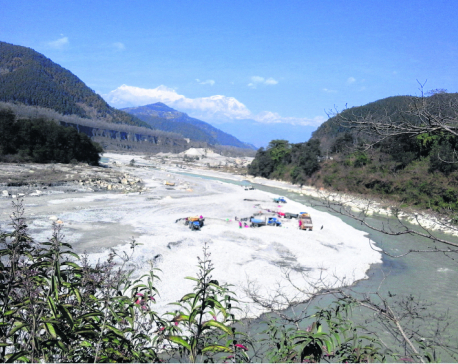 DOLAKHA, May 18: Stones and sand among other resources extracted from the Tama Koshi River are being black-marketed with involvement of crusher plants operating ion the banks of the river. Failure of the government to control the crusher plants from illegally extracting resources from the river has led to this situation, according to locals. Crushers plants near the Tamakoshi River, Dholi River and Gopi River have been selling stones and sand for over twice the amount of current market price. Apart from paying twice the market price while purchasing from these crusher plants, the locals are also forced to pay trucks a hefty sum of money for transportation. Many locals who are rebuilding their quake-ravaged houses have no choice but to pay the price set by the crusher plants and tipper operators. The money they charge for sand and stones are twice the amount set by the government. They also do not give the customers VAT bills. There are three crusher plants on the banks ob the Tamakoshi River. 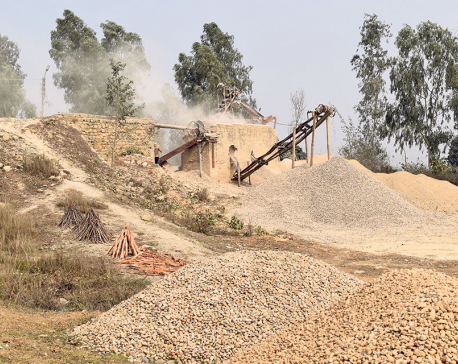 Locals have no choice but to purchase either from Shree Ekata Roda Dhunga Industry operated by Prithivi Bahadur Shrestha, Tamakoshi Roda Dhunga Crusher Industry operated by Suresh Upreti and another crusher industry operated by Ramji Upreti. Though the crusher plants are into black marketing of sand and stones, the local government body is unconcerned.